Correction: Thanks to an eagle-eyed reader, this story has been updated to remove the claim that Dip.io is the first FDA-cleared smartphone urine test. We've reached out to Healthy.io for comment on this development and we'll update when we hear more. Update 4/16/19: This story has been updated with additional clarity from Healthy.io about the difference between this clearance and previous similar clearances. 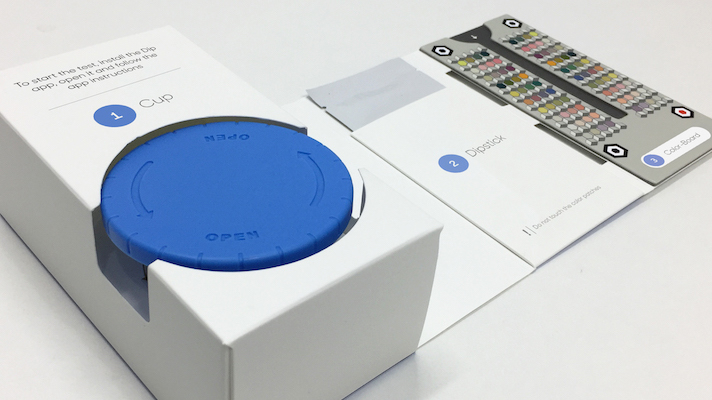 Tel-Aviv, Israel-based Healthy.io has secured FDA 510(k) clearance for Dip.io, a home-based urinalysis kit that turns a smartphone into a clinical-grade diagnostic device. The kit contains detailed instructions for home testing and disposable test strips and testing cups, but the major innovation is a panel of patterns and colors that allows the smartphone camera to accurately read the test strip regardless of lighting or environment. This means that unlike many existing at-home lab kits, patients don't have to mail anything back, and they can get results right away. Dip.io is already commercialized in Europe and Israel. In the UK, it’s available through a “virtual renal clinic” launched in June by the Salford Royal NHS Foundation Trust. In the US, the company has done a study with National Kidney Foundation and Geisinger Health, demonstrating a feasible use of the platform to improve adherence to care for kidney patients. Healthy.io specializes in healthcare use cases for smartphone-based computer vision. Beyond urine testing, the company is also working on applying that technology to the chronic wound care space. While the company has claimed the test is the first of its kind to clear the FDA, public documents show that Scanadu received clearance for a similar product, its Inui In-Home Urine Analysis Test System, previously known as ScanaFlo, in May. According to Healthy.io, their test is the first such clearance to claim an existing point-of-care test as a predicate device, rather than a visual reading by a nurse — which is how both Inui and Scanwell's clearances work. "This is not a merely an academic distinction," Adiri told MobiHealthNews in an email. "Automated urine testing (e.g. with a urine analyzer) or visual read are clinically two different processes. E.g. there are two different CPT codes: 81002 urinalysis by dipstick non automated vs. CPT 81003 urinalysis by dipstick automated." It's also worth noting that the space has a different sort of history with the FDA. A promising and much-touted app with a similar functionality, uChek, was hit with an FDA warning letter for marketing the app without clearance in 2013. Biosense Technologies never did receive clearance for uChek and the app has since been removed from the iOS App Store, though it still appears on Biosense's website.